I must be the biggest procrastinator around! I still have my yard furniture that needs to be put away for the winter - I think I am just blocking out the fact that possibly the next 5 or so months will be cold, snowy, and dreary, so maybe by me not putting away the furniture, I am holding onto hope that the weather will be nice. However, I live in Syracuse and it's almost guaranteed there will be tons of snow heading our way. So this weekend I took advantage of the above normal temperatures and started hanging up my Christmas decorations. This beats those 32 degree days and frozen hands trying to hang up wreaths. However, I did need to take all my fall decorations to the town's compost pile. Thought it may look strange hanging up my Christmas Wreaths, while I still had cornstalks, mums and pumpkins on the front step. The weather is warmish today, but it is raining out. I was hoping to finish up cutting down some flowers and shrubs, and of course putting away my yard furniture. Hopefully the sun will come out later and I can finish. 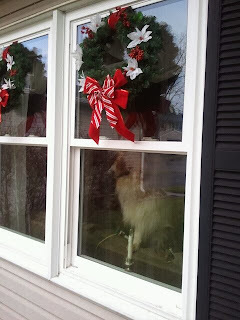 Here is a quick photo of Brooklyn intently thinking I'm crazy watching me put up the wreaths. More holiday posts to follow.